Who is Morningdale Log Homes? A Short Video Story. Well, it is April and along with it should come showers but it looks like Old Man Winter isn’t done with us so we are seeing much colder temperatures and that dang snow!. Regardless, after this month is a great time to start construction on a new home, and what better type of home to build than a LOG HOME from Timberhaven Log and Timber Homes! So what can we do take make it an even better time for you to BUY a log home? 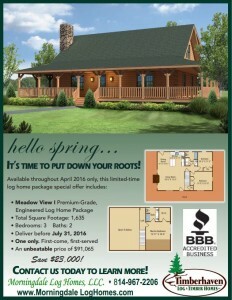 How about offering you a savings of about 20% on a Meadow View I package? It is a lovely 3-bedroom, 2-bath, 1600+ sqft home with plenty of room and charm for an active family. Well, we at Morningdale Log Homes are happy to provide you with more information on this specially priced home, or any of our other models, and help make your log home dream become your Dream log Home. Just contact us anytime to setup a no-pressure appointment at our model home and let’s talk. Don’t have land yet? Go to our Log Living Gazette section of our website and download the article on Finding The Right Land. We are certain that this will help you find the ideal spot for your new log home at a great price!